I had not seen Gremlins since it was in the theatre back in 1984. I remember loving this film at the time, and I also remember being surprised, thinking that this was going to be a funny, silly Christmas movie and being surprised by the darkness in this film. In a nutshell, a loving inventor-family man (played by Country Music Legend Hoyt Axton) finds himself in a run down curio shop in China Town, in the hopes of finding a unique Christmas gift for his son. After some cajoling, he leaves with a cute, little creature called Mogwai (later named Gizmo),with three, simple but important rules: No Water, No food after midnight, and no bright light (Sunlight would actually kill the creature). Of course, all rules are broken shortly after the arrival of Gizmo. An accidental water spill on Gizmo’s back (by a young Corey Feldman), creates a bunch more Mogwais – the new ones being more troublesome and led by the more belligerent one named Stripe after his mohawk like hair. Soon the jerk Strip tricks the son into feeding him and his brood after midnight (by chewing through the clock cord and making it look like it wasn’t after midnight yet). This causes Stripe and his crew to transform from the cute Mogwais into evil, ugly Gremlins that proceed to destroy the whole freakin’ town in short order – right during the whole Christmas season. It’s unusual to see death and destruction in a Christmas movie. Now, death and destruction in a Christmas movie that ends up being funny? That is an art form. I gotta say, this movie hold up very well. Speaking to a lot of people that saw this movie years ago, I find that many have forgotten that this is actually a horror movie. 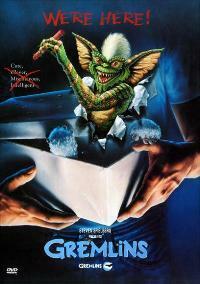 Most people just remember the cute little Mogwai and think it’s a fun little Christmas movie. I think they’d be surprised watching it again. Watch this movie – watch it again if it’s been a long time since you’ve seen it. It’s good… real good.